Oriole A. Vane Veldhuis, lives and writes in Winnipeg. Having enjoyed a wonderful childhood on a farm near Stockton, Manitoba, her heart remains in rural Manitoba. A varied career of teaching, Diaconal ministry, studies, parenting and travel provided a rich resource for writing. In keeping a promise to her father, Oriole’s research became too intriguing to hoard in her home. In For Elise she offers creative-non-fiction like none other. Every family has it own unique stories, but not every family is blessed with a storyteller as talented and tenacious as Oriole. 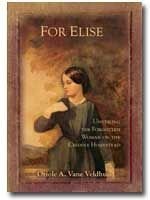 In For Elise she has painstakingly unwrapped her once secret family story, and transformed it into a great read that both illuminates the role of women in the settlement of our province, and frees her great-grandmother Elise. Recommended reading for those interested in family; in the settlement of Manitoba; in women’s history; and for those who just enjoy a really good story.